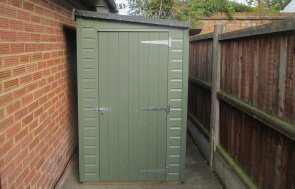 This Classic Shed featuring a pent roof is from of our wider range of garden sheds, all of which include free delivery and installation as standard. 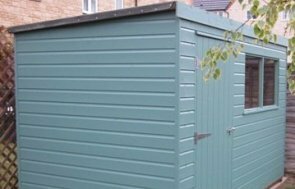 Designed and hand-built at our Norfolk factory using only the finest FSC® certified timber, the shed was then delivered and assembled at the customer's address in Horsham, West Sussex by our in-house fitting team. The exterior is clad with smooth shiplap and painted in the classic shed opaque paint shade of Mint, which is one of three available choices from our classic paint range. Others include the Moss and Stone options with a more natural choice being our Light Oak preservative stain. The building has a pent roof covered with heavy-duty, heat-bonded felt and double access doors leading into the interior. In order to take a closer look at our high-quality buildings, we recommend that you visit our show centre in Lewes which has a range of 25+ garden buildings on display, to allow you to see the quality and construction for yourself. Alternatively, please Contact Us directly or call us on 01760 444229 if you would prefer and one of our friendly team will be more than happy to talk through your requirements with you.